Here is iteration 17 in my quest for the ideal adjustable spreader. It comprises two lengths of 5 mm dia. aluminium rod -- knitting needles! Each length is 85 mm long, and emulates a "conventional" spreader which is effectively 60 mm long. The spreaders are bolted to the mast with a 20 mm long M2 screw. The screw passes through one spreader, while the other is tapped. They do not need to be attached very firmly, just finger-tight is fine. The idea is to clamp the end of the spreader against the shroud when it makes the right angle with the mast and shroud. To push the mast forward or pull it back, slide the end of the spreader up or down the shroud. The picture shows the spreaders rotated to point downwards, thus pushing the mast away from the shroud rather moderately. I'm currently attaching my shrouds at the mast head. This gives maximum leverage for the spreaders in their control of mast bend. Notice also that it is possible to control the mast bend independently of the backstay with this arrangement. These spreaders have their ends milled to an angle of 45 degrees. As they rotate around their pin to the mast at one end, their other end presents a flat face to the shroud for clamping with the M2 screw shown. In fact, the screw uses a folded washer to clamp the shroud. The spreaders can be rotated to point up, in which case they'll tend to push the shrouds out a little in the conventional way. Or, they can point down, and will tend to pull the shrouds in. The effect is quite modest. It would be quite easy to have sets of spreaders of different lengths, to make this effect stronger. 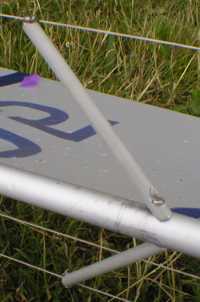 When rotated to a vertical position, the spreaders do not push against the shrouds very much, and so do not tend to bend the mast. Or, rotated towards the horizontal, they exert maximum force against the shrouds and bend the mast considerably. I experimented with these spreaders at the recent UK national ranking event, and was pleased with how they worked. Adjustment was quick and easy, and mast bend control was excellent. For the next iteration, I'm thinking about inserting a full pivot in the mast so that the spreaders are locked together and operate in unison, instead of each arm being independent. The down side is that the mast would have to have reinforcement in the spreader attachment area, adding weight where it isn't wanted.